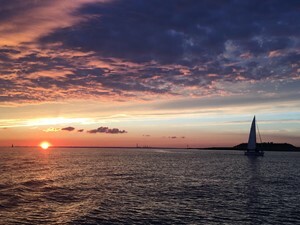 Although the weather was spring like the forecast seemed to offer nothing better than a mega driftathon for the first race of the RNSA(Portsmouth) Wednesday evening Spring Series. Very light north easterlies was the forecast from all the websites and with the light fading as BST was yet to kick in it did not bode well for the 8 yachts assembled at Gilkicker point. However as they had made the effort to get to the start line it would seem churlish for the SOOD Tinker T to not try and get the fleet away. With the light due to fade rapidly an agreement to start 15 mins early was made and to avoid the worst of the west going tide a short course of Darling Associates, Gleeds and back was set. Right on the gun the fleet with spinnaker poles set to starboard were suddenly hit with a major shift of breeze to the southeast - momentarily chaos reigned as boats found themselves having to head away from the mark until rapid gybes could be arranged. Option was best positioned to recover and rounded DA first hotly pursued by Tinker T and Sunshine. The intended beat had become a nice fetch for the fleet as they footed towards Gleeds with a dramatic sunset on the horizon behind them. A spinnaker run home had Jolly Jack Tar charging through the fleet with a great angle for her huge asymmetric kite but not quite managing to save her time on Sunshine which took line honours and the IRC win. Spirit of Kudu with a steady performance took the NHC honours. A new entrant this year is the First 40 chartered by the services charity 'Turn to Starboard', an organisation set up to help traumatised servicemen and women adjust to life outside the operational theatre. We look forward to getting to know the team. In the end a great evenings sail and superb start to the racing season. Many thanks to the HSSC team for the sustenance provided post racing.